Looking for your baby nursery furniture doesn’t need to be so overwhelming. I’ve scoured the internet for the best farmhouse crib ideas for you! 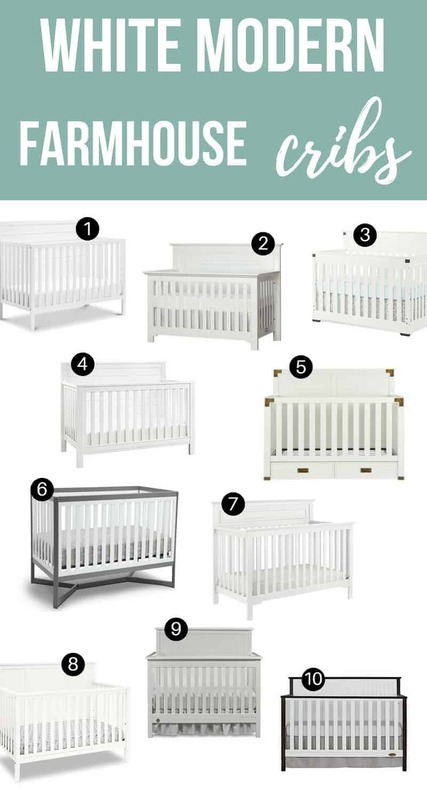 These 10 white cribs bring you all the essentials you need for your modern farmhouse nursery – clean lines, decorative accents with great contrast and, of course, a touch of shiplap. One of the first things I knew I wanted in our baby girl’s nursery was a white modern farmhouse crib. White furniture screams “farmhouse style” and I like how it brightens up a room. While I was working on the design plan for our nursery, I looked at a LOT of farmhouse style cribs. Searching for baby nursery furniture can be super overwhelming in the midst of everything else, I get it. To help you out, I’ve already narrowed it down for you. Here are some of my favorite modern farmhouse crib ideas. This budget friendly option also features the full back panel that is reminiscent of shiplap, so it’s totally rockin’ the farmhouse style. This 4 in 1 crib has a very traditional and clean look to it. It also comes in a gray crib option, which is oh so pretty. This one may look a little familiar to you. It’s the same crib that we have in our son’s woodland nursery, but in white instead. I love the contrast that the black hardware has one the white crib. I get a lot of questions about the rustic crib from readers. I can report that after 2 years, the crib still looks great. We haven’t converted it into the toddler bed yet, but that will come soon! I particularly like the back panel of this farmhouse crib, which reminds me of shiplap. Ironically, this is the crib that actually matches the dresser we ended up purchasing to go in our nursery. The gold accents on this modern crib are amazing! I also love the fact that it comes with drawers underneath for some extra storage. If there’s one thing you need more of in a nursery, it’s storage options! Designed to be the centerpiece of your nursery, this 4 in 1 crib features plenty of modern touches, a sleek X-shaped base and bold two-tone finish. It’s a little more modern than the other options, but I love it! This was definitely my favorite option of Walmart cribs. This crib really fits into any nursery design from traditional to contemporary with the high headboard, sturdy slats and refined molding. Loving the back panel of this farmhouse crib. I also love the decorative style of the feet. It’s ironic that we DIDN’T choose this one because we named our girl Quinn, just like this crib, haha! Loving the beautiful details on this crib like the stacked planks surrounded by the substantial moldings, which give it the appearance of costing much more. Ding ding ding! This was the winner for us! I love the dark charcoal accents and the clean lines they create on the crib. This crib is one of the more unique options and that’s why I love it. Looking for your baby nursery furniture doesn’t need to be so overwhelming. I’ve scoured the internet for the best farmhouse crib ideas for you! 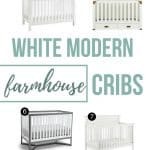 These 10 white crib options bring you all the essentials you need for your modern farmhouse nursery – clean lines, decorative accents with great contrast and, of course, a touch of shiplap. Which of these farmhouse crib ideas are your favorite? 10 White Modern Farmhouse Crib Ideas – you are here!